This year best friends Sophie and Agatha will discover what it is to be a student at the fabled School for Good and Evil, where ordinary boys and girls are trained to be fairy-tale heroes and villains. With her pink dresses, glass slippers, and devotion to good deeds, Sophie knows she'll earn top marks at the School for Good and graduate a storybook princess. Meanwhile, Agatha, with her shape-less black frocks, wicked pet cat, and dislike of nearly everyone, seems a natural fit for the School for Evil. But when the two girls are swept into the Endless Woods, they find their fortunes reversed--Sophie's dumped in the School for Evil to take Uglification, Death Curses, and Henchmen Training, while Agatha finds herself in the School for Good, among handsome princes and fair maidens in Princess Etiquette and Animal Communication. But what if the mistake is actually the first clue to discovering who Sophie and Agatha really are . . . ? 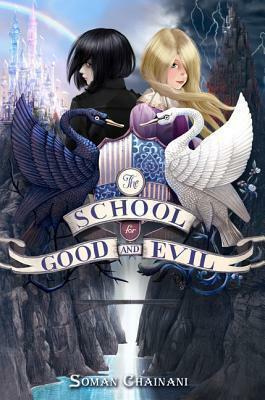 The School for Good and Evil is an epic journey into a dazzling new world, where the only way out of a fairy tale . . . is to live through one.